The 2018-2019 Season at the Bankhead just got more exciting! Our season is largely set by the end of May, but we jump on the opportunity to add great shows like these. There’s both returning favorites and artists completely new to our audiences. The list includes two blues greats, the return of Robert Cray on February 10 and Keb’ Mo’, making his first appearance at the venue on May 14. Country music stars Larry Gatlin and the Gatlin Brothers bring familiar hits from their long career such as “All the Gold in California” plus the stories behind the songs on November 16. Called the “ultimate feel-good show…90 minutes of indisputable joy,” The Choir of Man arrives February 17 with their rollicking concert set in a real working pub. The nine male band members sing, dance, and foot-stomp through music, from pub tunes, folk, Broadway, classic rock. All while pulling pints and inviting the audience to get up close and personal with the show. Back by popular demand, ukulele master Jake Shimabukuro returns on January 29 on tour for his just released album “The Greatest Day.” The new release features some of his most adventurous works, both original and imaginative covers of iconic rock hits. He’s sold out all five times he’s been at the venue, even the Bankhead’s inaugural year when he was largely unknown beyond his viral YouTube video. Tickets for Robert Cray, Keb’ Mo’, The Choir of Man, and Larry Gatlin & the Gatlin Brothers are on sale now. Member presale only for Jake Shimabukuro until October 8. And don’t forget an earlier addition! 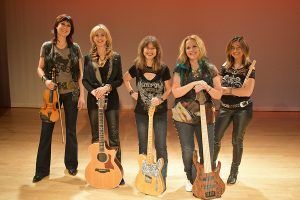 The Mustangs of the West brings their fresh California Country sound to the Bankhead on October 26. Started in Southern California in the early 1980s, the Mustangs have reunited and are ready to soar again. Bonus note — Suzanna Spring of the Mustangs is a Livermore local! Often seen at her studio, Dragonfly Yoga, Suzanna has been a Mustang from the very beginning, her guitar and vocals an integral part of their sound. Hear their latest song T-Shirt from California here and read about Paul Jefferson who will be opening for them at the Bankhead. *Tickets for all shows except Jake Shimabukuro on sale now. Member Presale for Jake Shimabukuro ends October 8.